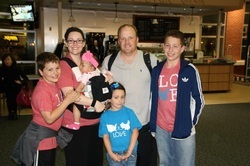 The Titus Task is excited to partner with friends and family of Jason and Erica Kennett as they welcome home their daughter Khloe, from China. We will give one dollar for every dollar their friends and family donate up to $2500, making the total amount $5000 (or more) - with your help! are a financial burden. Because their adoption is complete, we have implemented a shortened matching time of 2 weeks. Please consider a gift before April 25.